To share the lyrics that you are currently viewing tap the far right button with 3 vertical dots shown below. Then tap “Share”. When you tap share you will see the message below. 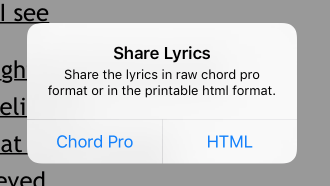 Chord pro – This is useful if you wanted to send someone a chord pro file. If you are having problems formatting your lyrics you can send this file to support@setlisthelper.com. HTML – Choosing this option will allow you to share a single web page in the format that you are currently viewing. 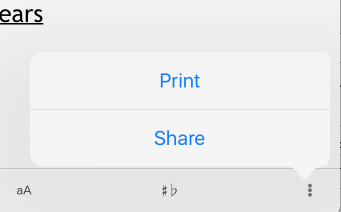 After you choose one of the above options it will open the iOS sharing screen. Choose one of the System options such as email or text message to share the file.